I am not a huge lover of Halloween. I don't like being scared or experiencing the creepy side of this holiday. I don't get a lot of the decorations that go up or having a party to celebrate it. However, I do love pumpkins, carving pumpkins - and the little kids dressed up as Winnie the Pooh characters who come to my door - I love that as well. 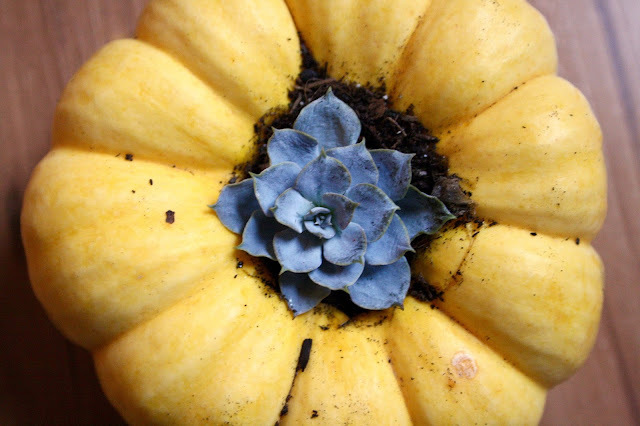 Since I like my pumpkins and because there is a pumpkin contest going on, I wanted to highlight a couple of projects that I have been LOVING this week. All made by me, except for one, which was made by a very close family member. A family member of mine made these adorable cement jack-o-lanterns! She had several half bags of cement in her garage and wanted a craft to use them up. Using a plastic, hollow trick-or-treat pail from the dollar store, she filled it up with cement. She placed a nail on the top, for the stem, before it had time to dry all the way through, and once it was completely dry, she then removed the mould. This was her result. 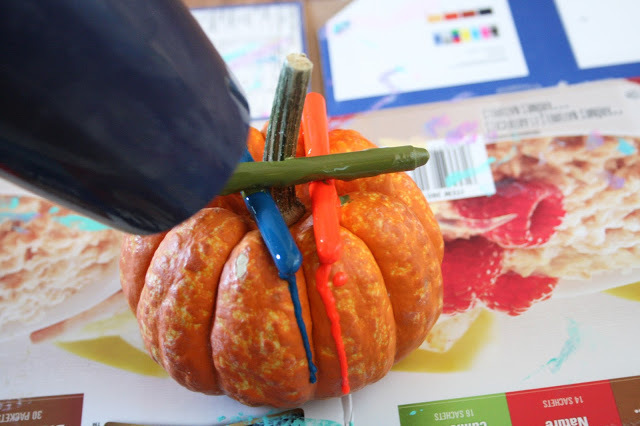 I really like painting pumpkins. Wanting to try something a little different than my daughter's rainbow pumpkin, I went for black. Once the paint was dry, using glue and copper sparkles, I painted on each ridge. I love the look of this. I almost wish it wasn't real so that I could keep it until next year. 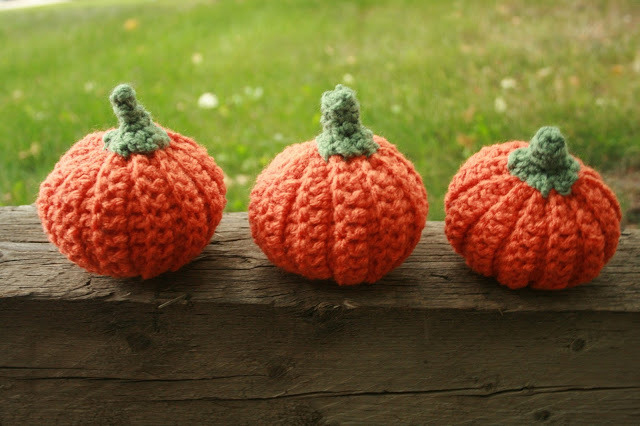 For the past three years I have crocheted these little pumpkins. It now feels like tradition to do so. The pattern can be found here and they take no time at all! My toddlers even love throwing them around. Many of you know that I like my succulents, how could I not try to combine the two? I think this was so cute, however, my two (almost-three) year old did NOT like that I had to remove the stem for this project. Poor Bug. Melting crayons is oddly very therapeutic to me. Highly recommend. haha. 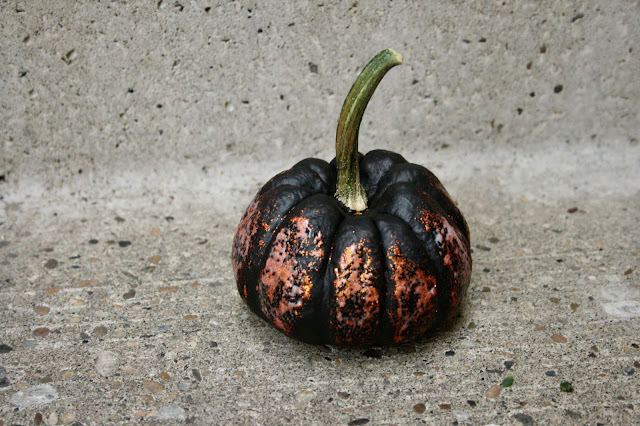 The first pumpkin that we tried ended up vert autumnal, but I have dreams of what the next pumpkin is going to look like. We are still accepting entries for Knotted Home's Pumpkin Contest!! Click here for more details as to how you could win a homemade prize! !